♕Clinical examination, safe and accurate. ♕One-button measurement, simple and quick. ♕3 modes for measuring the temperature of body,surface and room. ♕Store 32 measurements to compare body temperature changes. ♕High temperature alarm, promptly reminding abnormal body temperature. ♕Do not expose this thermometer to extreme temperature conditions higher than 130°F or lower than -4°F. ★Safe and Accurate★:Safety and accuracy are the most fundamental and primary requirements of our team. 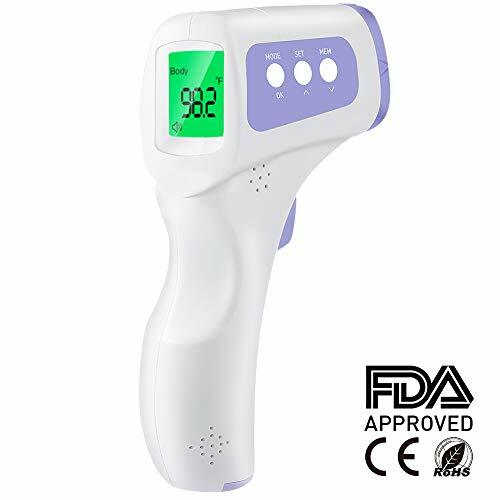 With the high-tech infrared temperature sensing technology,this device can safely and accurately measure the body temperature of baby and adults.It's safety and accuracy have been clinically validated by FDA and CE. ★Simple and Fast★: With one key operation, just press the button to start measuring, and the result will be out put in one second. The LCD display makes the readings simple and clear. ★3 Modes★: By pressing the button to measure the temperature of the room, a human or cup immediately. Easy swich between body mode, room mode and object mode. ★Most Recordings★:Memory sets allow 32 data stored so that a little difference will be detected. Pressing the MEM button can help you read the stored data. ★2 Years Warranty★:We provide a 24-month warranty and professional customer service support.That means if you have any questions about product,we will solve it as fast as we can. View More In Diagnostics & Screening. If you have any questions about this product by CocoBear, contact us by completing and submitting the form below. If you are looking for a specif part number, please include it with your message.